"This race out does itself! " This was my 3rd year running this race and as always, the event staff hit it out of the park! The weather was gorgeous and although there is no control over the weather, it seems as though this race has always been blessed with sunny skies. And actually, Whewh!!! it was a WARM one in the upper 70's at the finish! From the race swag to the course details....if you're anywhere close to La Crosse, WI - this NEEDS to be on your bucket list. The course isn't a walk in the park though; quite literally, there are all sorts of elevation changes right from the beginning! Make sure you're ready for hills because throughout the first 7 miles of the course, elevation changes frequently. The later half is mostly flat, so you can look forward to that. The course starts on the iconic and beautiful TOP OF THE BLUFF. There is a very nice 2 mile downhill where you're sure to pick up some speed, but make sure you use some control or your quads will be screaming by the end. Most of the "meat" of the course winds through lovely neighborhoods and bike paths, and it's at the last 3 miles of the race that the beauty of the Mississippi River starts to unfold. I really appreciated the course change, which utilized a NEW path along the river. The water stations are equipped with water and Gatorade at every stop and several had opportunities to grab race fuel. I'm not one to grab fuel that I haven't prepared myself, but I think it was GU on the course. The expo is small, but this is a small race - I'm not sure on the numbers but I think only 3,000 between the half, the 5K and the kids run. It's an expo with a few booths and a grab n go race bib. My suggestion would be that the race directors have the packets ready at pickup - they put it together when you got there. Not a huge deal, but I think it may make things a bit more seemless. The finish line is gorgeous! Full panoramic views of the Mississippi River bridge and a huge expansive park sitting right on the river! Grab a spot of grass and enjoy that finish line medal! The post-race party is one of the best. You are treated with Brats and Beer in true La Crosse fashion, but also can grab the usual fair of bananas, cookies and chips too! And, don't be afraid there is plenty to go around! My kids may have grabbed a snack too. SSHHH. :) And, speaking of kids - there is always a bouncy house to entertainment and ducks swimming at the edge of the river - ready for a snack! But, the best is always last right? The medals are always AMAZING. I have three and they still manage to be my favorite every single year. I also liked the quality of the tshirt this year. Great brand and cute design. Maybe gender specific next year? - this year they were unisex. This is definitely a race I will continue doing and one you should mark on your calendar. It's always the beginning of May and if you register early, the entry fee is reasonable. You will NOT be disappointed. This is my 2nd time running Grandma's and like the last time, the race did NOT disappoint! Duluth is truly a wonderful gem of a city with great energy and beautiful scenery. The trip to the North Shore is worth it alone to check this marathon off your bucket list! EXPO: Large expo with great guest speakers. Fantastic all-you-can-eat spaghetti dinner which will for sure fill your belly before your race! I highly recommend this option because it can sometimes be hard to get a table at the local restaurants on marathon weekend. Why not just pull up a chair and eat at the expo before closing for the night?! No brainer! And, the pasta was great! AID STATIONS: Grandma's knows how to cater to their racers. So many volunteers make this marathon a success. Cold sponges, ice, Powerade, water. You are never without a necessity. Along the course spectators also help you with basic necessities. Vaseline anyone? The national guard is posted on several locations t/o the course to lend a hand if one is needed. Porta-potties are frequent and usually only had a few runners waiting at a time. Transportation to the race: Grandma's requires that all runners take a shuttle to the starting line either with the train or a bus. The shuttles are plentiful so there should be no problem getting one one. This year, I took the train - it was a fun experience, but a bit cramped. Nonetheless, it's always fun to ride the train along the lake - race day we had a nice view! SCENERY: You can't beat the lake view. While you don't see the lake your entire run, you do get great glimpses of the lake and the cool breeze is a welcome feeling when it's hot. The weather can be a bit of a wild card in Duluth in the summer - however, I will say that this year was fantastic. It was sunny, but only about 72 so not crazy hot! 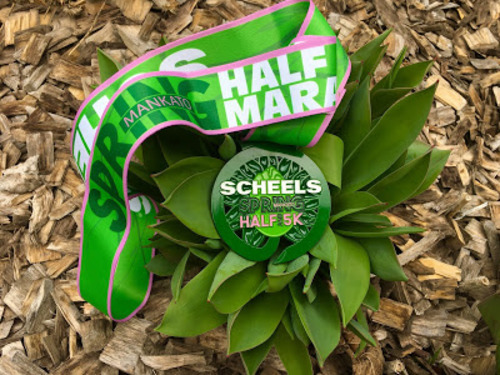 The course itself is fairly flat - but does have some rolling hills, none of which are very steep - but if you're expecting very flat - this is not it, but there are NOT large hills - Grandma's is famous for BQ's because most runners are able to finish fast due to the course. The race does have about 8700 runners at the marathon start, so porta potties are busy but there are hundreds of them. My suggestion is to get in line at least 30 minutes before the start so that you are sure to get a visit in before you start the race. The post race fair is great as well with fresh fruit and bagels. Each finisher gets a drink ticket for beer or soda and the Country band at the finish tent is great! It's a nice place to unwind after the race and is not tremendously busy either, which is nice. Let's talk about the medals. In the last few years - these medals have been fantastic! For 40 years prior, they were a simple circle medal with the grandma's logo. Iconic for sure, but in the world where people covet their medals, I really am happy that grandma's design team has brought out NEW and BIGGER medals. This year - it was beautiful! All race finishers receive their t-shirt at the finish line and if you registered early you got an extra track jacket too! This race is truly awesome and I would recommend it to anyone. Sidenote: The ONLY negative is lodging. Prepare for a spendy visit as hotels require a two night minimum stay and they can be upwards of $500 for the weekend. The Dorm is a bit less spendy, and seems to work well for another option. Be sure to book lodging early. Check outside of the city if you don't mind driving in as your rates will be much less expensive. Don't forget to take a dip in the lake after your race! It's a nice "ice" bath! "Scenic Race a MILE HIGH! " If you're a "flat-lander" looking for a challenging race at elevation - you can't go wrong with this race! This downhill race has a few rolling hills but due to the nature of the downhill in the canyon you will fair well. The race starts at 5500 ft and while you do feel the elevation, start out slow and you will be just fine. This race is a smaller race with only about 1000 people running. I loved the smaller field size. Most of the race is on a two lane road or paved trail. Very scenic. The race finisher shirt is a BROOKS technical running shirt which is great! Fits and washes well and it was a bright color. Race organization was great. We received many race e-mails leading up to the race with clear communication and if you followed twitter and instagram you got even more. On course aid stations had NUUN, water and Honey Stingers. Porta potties were spaced accordingly on the course. If you're looking for spectators to get you through, there weren't many. This race was one to truly enjoy your experience and the scenery around you. Open pastures, beautiful foothills, Colorado mountain air. I am SO glad I chose this race. Even though this race has a small field size I much prefer that over very large races. It was an intimate race with a fabulous post-race celebration in Old Town Square. If you haven't checked off Colorado on your state list - do this race. "Great race! Short Course. " This was the inaugural race. I'll get the elephant in the room out of the way right now. The course was .5 mile short. Somewhere between mile 4 and 5 I believe the turnaround had everyone off course. The race was a certified course but organizers definitely missed the mark on this one. I discussed with about 15 different runners at the finish and we did all concur that the race was short. Unfortunately, this was a HUGE mistake for the race. But, I am confident that this will not happen again so I will most likely run this event again. A friend of mine emailed the race directors and the response was we will strive to improve the race next year. The SWAG for the race was great and the cost was moderate. I paid $71 after fees. The medal is truly beautiful. Parking access was perfect and free. The parking lot was the starting line so it can't get easier than that! Scheels was the event sponsor, so the race started in the Scheels parking lot. I loved this because that meant flush toilets, in addition to porta-potties and a little shopping before the start. Race organizers were friendly and packet pickup was great! There are several options for the timing of packet pick-up. Because I lived out of town, I really appreciated that I could pick up my packet the morning of. I also had to exchange my race shirt and that was absolutely no problem. The course was quite hilly. Don't let the website fool you. There was a gorgeous paved trail with a combination of flat and downhill for about 3 miles, but the hill at mile 9 was brutal. This course doesn't protect you from the environment either, so be prepared for that! Race day was very windy and we were exposed. It tested mental toughness for sure! Post-race fare was your typical banana and granola bars, but they were plentiful. "Beautiful Start and Finish at the State Capitol"
Great urban race with a small town feel. I really enjoyed this race because it had plenty of runners but not too many. In the half marathon there were just over 2100 finishers. For a larger city, this was great! The streets were not too crowded and you weren't bumping elbows the entire race. Win-Win. Madison Marathon Race Management does a great job with organizing this race from start to finish. There was never information I could not find and if I had a question, I received immediate responses. Way to go! So often, races fail to communicate effectively. EXPO: I gave 5 stars for the expo quality because even though it was quite small, it was well-managed. Easy ramp parking for $5 made it very accessible and on-street parking was also available. Packet pick-up was a breeze. I received my personalized bib with timing chip, my long sleeve tech tshirt and a few other incidentals. I really liked the perk of the American Flag placed on the bibs of all veterans that ran this race! Awesome job! STARTING LINE: Tons of porta-potties with short wait times. I was able to make one last stop before the race start and didn't even have to wait! Excellent! They were close to the start as well. The runners were all in the same corral, but pacers did line up accordingly, so if you wanted to run with a pacer they were there. Two separate start times for the marathon and half-marathon. All of the course runs on pavement with some areas open to traffic. Runners ran on one side of the cones and all major intersections were accounted for with police officers. For me, a partially open course is a bit of a downer - I run on the outside to be as far away from other runners as possible - I had to dodge in and out of a few cones now and then. Nothing earth-shattering, but my only negative of the course. Watch out for about mile 12 1/4. A substantial hill at the finish, but if you can conquer it the finish line is close! Keep going! You can do it! WATER STOPS: There were MANY opportunities for water and Gatorade and they came often. I did not carry water with me on this run and wouldn't have needed to. Great job there. My only suggestion would be to have the water first and Gatorade second or vice - versa. They were not the same at every one. 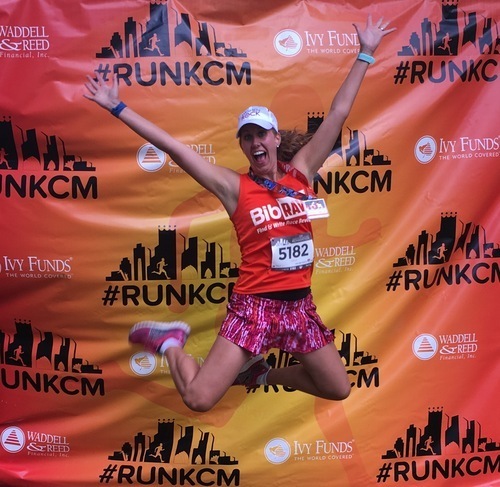 FINISH LINE: FREE RACE PHOTOS! Such a HUGE race perk. Thank you for that! Heat blankets, finish-line photos, instant race results printed, ample food selection and post-race band that played until 12:00. I was also very pleasantly surprised at the race day parking. Ample FREE race parking on the street on race day. If you weren't lucky enough to snag a street spot there were ramps everywhere with reasonable parking rates!